With a spectacular waterfront setting, the Marriott Marquis San Diego Marina is steps from the famous Embarcadero path and historic Gaslamp Quarter. Rent a tandem bike and ride to Seaport Village, the USS Midway Museum or they eye-catching Star of India ship. With so many places to investigate, what better way to see it all than on a bike? Just because the sun sets doesn’t mean the fun stops. In fact, it’s only just begun! When the sun goes down, Wheel Fun Rentals unleashes their night-time Surrey rides! 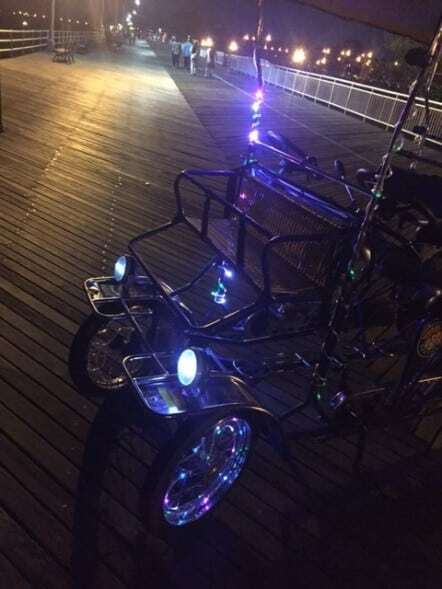 Visitors and locals alike will be able to light up the waterfront every Friday and Saturday night this Summer through Labor Day with Wheel Fun Rentals’ signature cycles. LED lights are mounted on Single and Double Surreys making for an unforgettable night-time cycling experience! Night bike rides are available every Friday and Saturday evening from Sunset until 10 p.m. through Labor Day. (Night rides will also be available Sunday Sept. 2nd for the Labor Day Weekend holiday). Note: last one-hour rental goes out at 9:00pm and last half-hour rental goes out at 9:30pm. There are no reservations required, and rentals start at just $30 per hour.